Tabs are turned on system-wide for OS X in the Dock pane of System Preferences. This activates tabbed windows for many OS X apps. Unfortunately it breaks the Deluge layout. 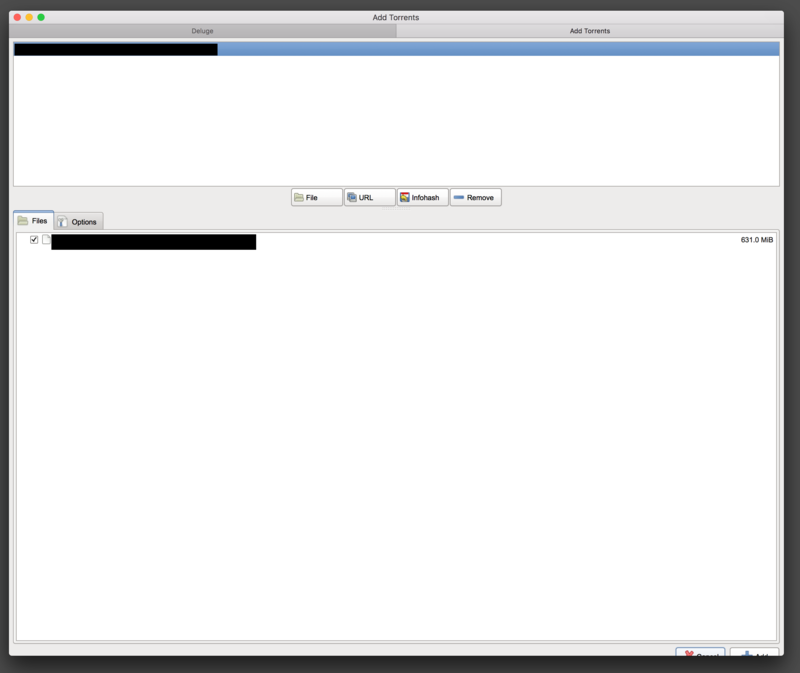 For instance, the usual modal that opens for a new torrent now becomes a full tab. That would be fine, but the click area is offset 20px or so upwards. The click areas no longer matches the displayed layout. Below is this tabbed page. You can see the bottom portion is cutt off. That's not a screenshot error, that's how it loads. If you want to click the buttons down there, you have to click about 20px above them, where they SHOULD load if they weren't being cut off. If you resize the window, the layout adjusts itself properly. However, you have to do this after any action that opens or closes a tab, as it breaks every time. I've tried reinstalling Deluge. This UI behavior is consistent on two separate OS X systems I use (they aren't backups of each other, totally different systems).